replacing them with “trigger-pullers,” Defense officials say….Services performed by troops that are no longer considered crucial could be outsourced to contractors or eliminated, officials said. 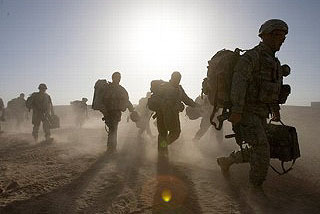 President Obama announced in March that he would be sending 21,000 additional troops to Afghanistan. But in an unannounced move, the White House has also authorized — and the Pentagon is deploying — at least 13,000 troops beyond that number, according to defense officials. The additional troops are primarily support forces, including engineers, medical personnel, intelligence experts and military police….”Obama authorized the whole thing. The only thing you saw announced in a press release was the 21,000,” said another defense official familiar with the troop-approval process. So the Pentagon is pulling out 14,000 support troops and replacing them with combat troops, and then they’re sending over 13,000 new support troops to help out all the combat troops. That can’t possibly be right, can it? Perhaps Julian Barnes and Ann Scott Tyson could get together and write a joint story clearing this up.